Portable power is still most popularly based on 12 V lead-acid batteries. If you live somewhere very sunny, and can afford the initial costs, solar power can now be an attractive alternative. Batteries which achieve higher storage density, such as NiMH and Lithium, are of course superior in many respects, but you still cannot beat lead-acid batteries in £$€ per watt-hour. My particular need is to power amateur radio transceivers, which prefer to be fed 13.8 V, and will draw up to 3 amps peak when transmitting at around 5 W output. Higher-power portable transceivers can demand as much as 20 amps (for an Icom IC-706MK2G transmitting at 100 W full power), but I am content with my meagre 5 W, which is far easier to support. There are some suppliers who offer rechargeable batteries which will deliver around 13.8 V, but these are a very expensive option. So we are back to the problem of delivering 13.8 V from a 12 V battery: getting a quart out of a pint pot. If you measure the voltage at a standard 12 V lighter socket, either of a standalone battery unit, or in a vehicle, you will find that it is anything but constant. In a vehicle with the engine running, or a freshly and full-charged standalone unit, you should obtain a voltage well in excess of 12 V, although not usually as good as 13.8 V. With the engine turned off, or the battery partially discharged, output falls below 12 V.
Thankfully most electrical equipment, including radio transceivers, is also more flexible. Digital equipment, such as my ELAD FDM-DUO SDR, is usually more sensitive, but ELAD claims that it can operate comfortably in the range 12.4-15.2 V (i.e. + 10%). Radios designed to be used outdoors, like the Yaesu FT-817, will work with even lower voltage, below 10 V, although they will normally limit output power as a result. This flexibility arises because the great majority of DC electrical devices do not work straight off the supplied power, but condition it further to slightly lower voltages, such as 10 V, which is what they actually need. However every section of cable from the battery, and every step in the delivery of power to the equipment, results in a drop in voltage. So as your nominally 12 V battery output falls, your equipment will start to run short of power. The simple answer is to use a voltage conditioner, which is in fact a switch mode regulator, to bring the voltage up to 13.8 V or thereabouts. You can buy one off the shelf for over £149 or $159, the MFJ-4416B. However Amazon and eBay have plenty of more basic units on offer for less than £20 or $20, and some are as cheap as £8 or $8. Choose one of the units on offer through your favourite online store or physical retailer. The most important criteria you need to apply are that it accepts an input voltage of 10-14 V, that it delivers a regulated voltage of 13-14 V which you can adjust, and that it will provide a current appropriate to the equipment you will be using. The cheapest and most basic units are claimed to deliver 2-3 A, which means up to 2 A continuous, and 3 A for short peak demand. For equipment which could draw more than 2 A for longer periods, I prefer a greater margin, and I chose a model rated for 8 A. Some come with built-in voltmeters, which can be helpful, and those handling more power have bigger heatsinks or even cooling fans: this is because they are not 100% efficient, usually more like 90%, and the power which they lose is generated as heat. So a 100 A unit could put out quite a lot of heat, which needs to be dissipated properly, through a cooling system. Shown above are four quite different units from the same supplier, DEOK, via Amazon.co.uk (also available on Amazon.com): from the left, an LM2577 Boost Converter rated at 2-3 A, a Power Source Step Up Boost Converter rated at 6 A, a Boost Buck Converter rated at 8 A or so, and an Automatic Boost Buck Converter rated at 150 W. Prices ranged from £8.18 to £25. Sadly specifications and literature are largely lacking, but the units appear quite well designed and constructed. I am also baffled at what a ‘boost buck converter’ might mean, but it works as a search term. You also need a 12 V lighter plug and socket, with some cable to connect them to the voltage conditioner. The easy way of doing this is to buy a 12 V extension set, and cut that to splice the conditioner into its power lead. Ensure that its current or power rating matches the conditioner: for my 8 A unit, I bought an 8 A rated extension with good thick, low-resistance leads. Allowing a suitable length of lead at the plug and socket ends, cut the lead, and identify which wire is the positive. Some extensions may colour this red, but most do not. In 12 V lighter circuits, the positive polarity is the centre stud in the socket, and the ‘nose’ of the plug. A multimeter makes it easy to establish which of the wires in the lead connects to the centre, positive terminals. Strip sufficient of the power lead to connect to the terminals in the voltage conditioner, and assemble. 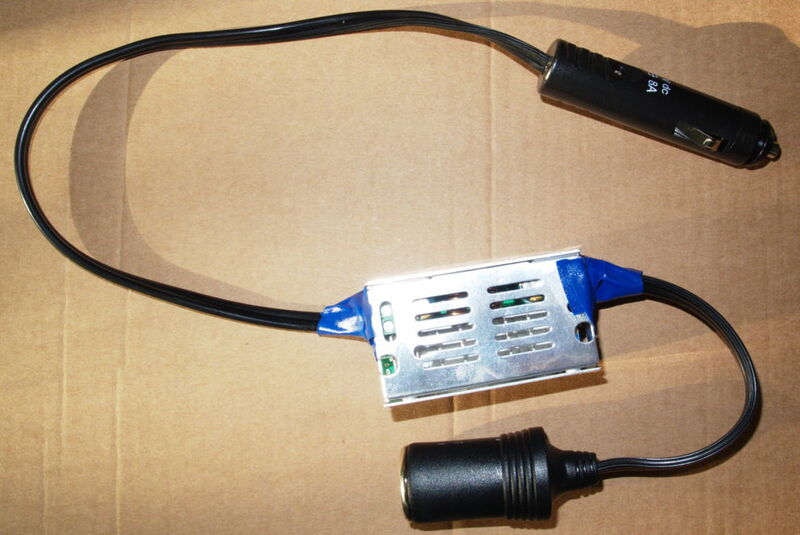 Note that the 12 V plug will be on the input side of the conditioner, and the socket on the output side. Once assembled, you need to test and adjust the output voltage. If your unit does not have a built-in voltmeter, you will need a multimeter to do that. It is also wise to put a load across the output side, such as a 12 V 2 A (24 W) bulb, when adjusting the output voltage. Most units are adjusted using a variable resistor, controlled by a screw. Simply connect up to your 12 V battery, power up with the load, and adjust the output voltage until it is around 13.5 V or whatever your equipment needs. For most equipment, all you need do now is pop the completed system into an appropriate box, available online or from a physical retailer, rather than using my botched rig with insulating tape. Ensure that the leads are secured so that stress does not fall on their connections to the conditioner, or you could find yourself having to repair it later. However if you use the completed conditioner system near any radio receiver, you are likely to discover that it emits a little radio-frequency noise. For amateur radio use, this merits additional attention in the form of screening (putting the conditioner in an all-round metal box), and possibly more. Stuart Wisher, amateur callsign G8CYW, has written an excellent account of these voltage conditioner units, and detailed how you can eliminate their RF emissions. This was published in the RSGB’s monthly magazine RadCom (online access for members only), August 2015 (vol 91 number 8), pages 32-3. Hopefully this will enable you to operate portable electronic equipment with a healthier input voltage despite only using a cheap 12 V lead-acid battery. Posted in General, Macs, Technology and tagged conditioner, Portable, power, radio, voltage. Bookmark the permalink.